Licuala are palm trees (family Arecaceae) that are more commonly known as fan palms that have leaves which are mostly circular in outline, with sometimes undivided but more commonly divided wedge-shaped frond segments. Locally known as palas, the fronds are used for thatching and also as a food wrapper/container (think of ketupat daun palas). Examples of commonly planted Licuala include Licuala grandis - the Ruffled Fan Palm/Vanuatu Fan Palm and Licuala orbicularis – the Sarawak Palas Palm. The genus name Licuala is the Latinised derivative of the local name for the palm in Celebes (Sulawesi), i.e. leko wala. There are about 145 species of Licuala, ranging from Bhutan and right down to Australia. The stems can be solitary or clustered, and in some species, subterranean. One of the lesser known members of this genus is Licuala mattanensis. Licuala mattanensis is an understory forest palm found in Borneo rainforest (Sarawak and Kalimantan). 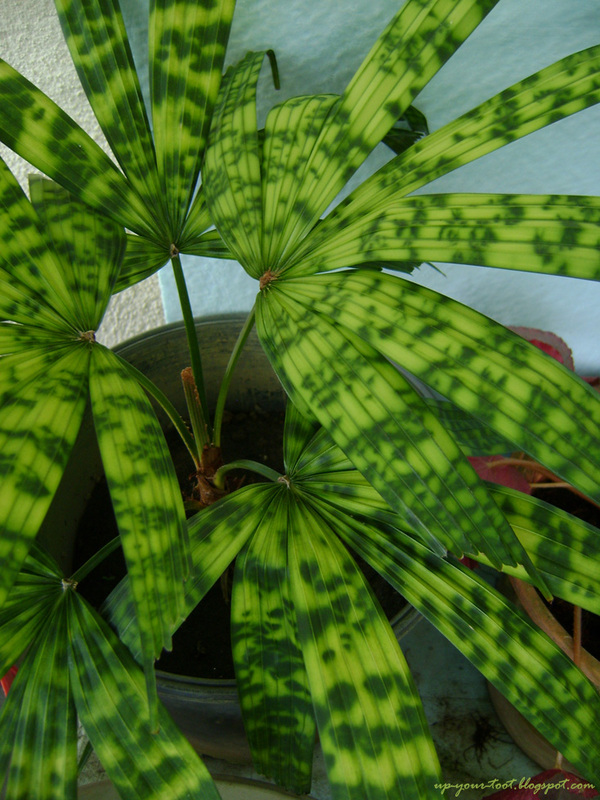 The strikingly tessellated foliage cultivar/variety called Mapu is sought after in cultivation. This palm is sometimes referred to as the Mapu palm or the Paradise Palm Mapu. The Mapu palm is slow growing and likes dappled light especially when they are still young. This palm is a dwarf when compared to the other Malaysian Licuala palms, and will only reach a height of 3 meters after decades of growth. The Paradise palm 'Mapu' after many years of growth. I got this Licuala mattanensis cv. ‘Mapu’ from Fauzi (4zeplant – http://www.dapat.net/4zeplant) years ago. I then passed it to J & A who stays at the penthouse on the other block and it has been there since. After 5 years or so, the plant is still less than 15cm in height! The leaves have sort of a mottled appearance when young but now look more like tessellations. Though slow growing, the foliage is striking and the light requirements make it more suitable as an indoor plant. 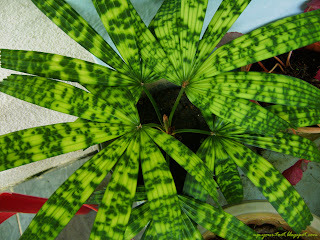 It does have a very eye-catching striking leaves. I have not gotten into indoor plants yet but it won't surprise me that I will caught the bug too soon enough...hehehe...I am recording it in my memory. I was just imagining that it would look great in a spacey bathroom. Oh yes they do look striking, almost in a psychedelic way. I too think it would do well in a bathroom - it would be moist and only have dappled light. I like the patterns on the leaves. The plant will surely brighten up an indoor space. Does it have thorns? It surely would. So far the plant doesn't seem to be producing any thorns, but many Licuala do.